Image Sensors World: Sony Image Sensor Split "is both expected and surprising"
Sony Image Sensor Split "is both expected and surprising"
Sony image sensor business spin-off is called "both expected and surprising at the same time. Over the past two years, Sony has spun out its audio and video business (February 2015), and its TV and PC businesses (February 2014). However, the semiconductor spin out is different. While the TV, PC and A/V businesses had been struggling to some extent with increased competition and a slow-growing world economy, the semiconductor business has generated a significant amount of Sony's recent revenues and profitability. The semiconductor business is highlighted by image sensors, a historically successful and profitable business for Sony. Today, it dominates the CMOS image sensor business, with Q2 2015 revenues of slightly over USD1 billion, good for over 42% of the worldwide market, nearly three times the revenue of its closest competitor, Samsung Electronics. Why interfere with a good thing? 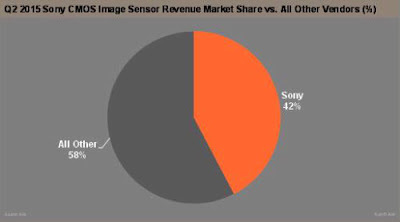 The current Sony corporate structure seemed to be working well enough to ensure image sensor success. How will the new Sony Semiconductor Solutions benefit the image sensor business? The answer may be in simplifying a corporate structure so that Sony can react more rapidly."